The highway stretches over 35.4 km, from Had Soulam to Tnine Chtouka, and includes a number of bridges and underpasses. 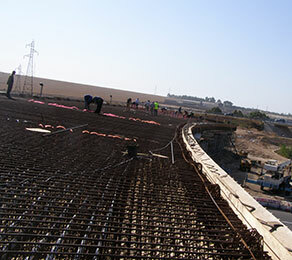 CCL was commissioned to work on this multi-lane, post-tensioned box girder bridge by client Société Nationale des Autoroutes du Maroc, having worked closely with consulting engineers Scetauroute and Team Maroc. The CCL XM multi-strand system was used to great effect to meet the exacting standards set by the designers. The support of the CCL group, which has experience not only in post-tensioning, but also in many forms of specialist bridge engineering, provided assurance that an appropriate solution could be found. The local presence of CCL enables the company to mobilise its resources quickly and meet the tight deadlines on the project, allowing the bridge to be completed ahead of schedule. The CCL XM system, which meets the requirements of ETAG 013, was used for the first time in Morocco on this project and provided the client with further reassurance of material and design quality. As well as supplying and installing the post-tensioning systems, CCL designed and supplied the elastomeric bearings for the project, along with specialist equipment required by the contractor HANDASSA ENTREPRISE BTP.